Turin (Torino) is the capital of Italy's Piemonte (Piedmont) region, in the far north-west of the country, and is famous for a curious assortment of things: including Fiat, chocolate, football and the Turin Shroud. Close to the Alps, Turin makes a good starting-point for skiing holidays; it also deserves a few days to itself as tourist destination. Turin does not have the political importance it once held before the parliament of a united Italy moved to Rome, but the city is a major industrial centre (most famous for car manufacturer Fiat) and the attractive town centre is cosmopolitan and gracious. The city is full of noble equestrian statues of Savoy princes and elegant arcaded streets for all-weather shopping and strolling, with an atmosphere that is calmer than most Italian cities. The car parking, though, is notable even by Italian standards: drivers make a habit of abandoning their cars in the middle of streets and junctions. Pedestrians should be aware of the many streets which pass through the arcades: you can be strolling along under a portico window shopping when a car cuts across your path. Turin's tourist attractions include the Mole Antonelliana, a strange, spire-topped building which features on the Italian 2 euro-cent coin. A good museum of cinema is housed in the building. Other Turin museums include the excellent Egyptian Museum (see our tourist attractions page). Piazza Castello is the heart of tourist Turin, home to grand palaces such as Palazzo Reale, the royal palace of the Savoy dynasty, and Palazzo Madama, previously a castle, prison, barracks and senate house. 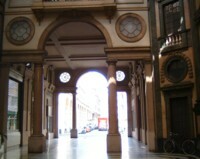 Around the Piazza - and indeed throughout Turin - you will find elegant historic cafes; an important part of Turin life. Turin is home to two major football clubs: Juventus and Torino. Juventus are one of the most successful and powerful clubs in Italy with a large fanbase through Italy and beyond, while Torino are the team of choice for many locals. Both teams play at the Stadio delle Alpi, a panoramically-situated stadium on the edge of town, with special bus connections on match days. Turin was the base for the 2006 Winter Olympics, and there are several good skiing resorts within easy reach of the city. Turin is also renowned as the setting for the original film of The Italian Job, starring Michael Caine, and fans can enjoy themselves spotting locations from the film. Turin airport (also called Caselle) is located 16km from Turin. It is an international airport, served by budget Ryanair flights from the UK. Buses (approximately half-hourly) connect the airport with Turin's bus station and the Porta Nuova railway station. Tickets can be bought from news-stands or onboard and the journey takes 40 mins. There is also a train service every half hour, running to Turin's Stazione Dora.